The first step was to figure out how to let the microphone on the sound sensor hear sounds without letting water touch it or the board. We came up with a few ideas, including encasing the whole sensor in tape, foam, or a mesh that wouldn't let in water. We eventually settled on removing the microphone from the board and soldering it to a wire, and then soldering that wire to the board. That way, we wouldn't have to worry as much about the board getting wet and only had to worry about protecting the microphone. 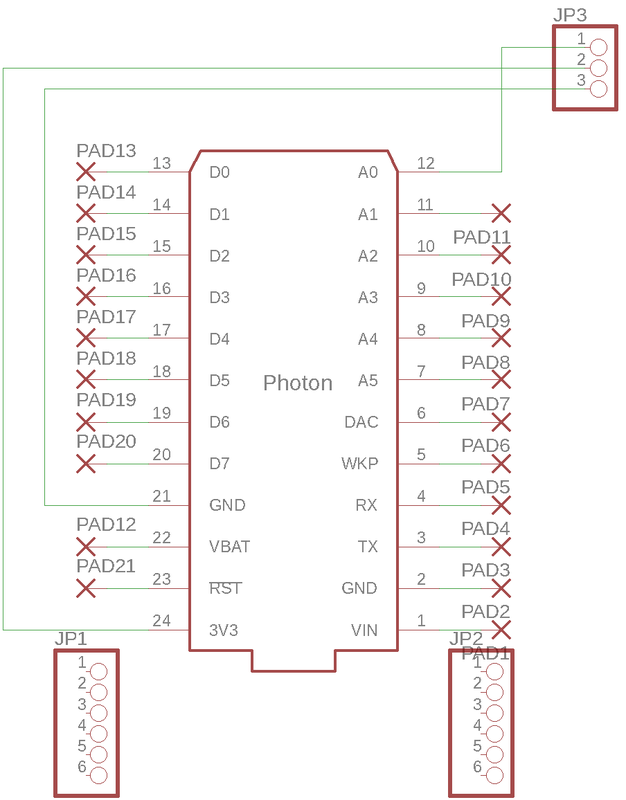 We created a custom breakout board for the Photon to make it easier to connect the sensor to the correct pins on the Photon/Electron. Next was to write the code. All we had to do was write the code to pull the data from the Photons and Electrons and put it into a Google Sheets. We had to find out how to pull published data from the Particle Cloud and format it correctly into Sheets. To test the sensor, we placed it in a box with the microphone muffled by a sweater to prevent any outside noises from getting in. We placed a phone playing white noise in the box with the microphone so we could get control data. Practical ways to attach sensors to walls, poles, etc. All would determine the overall shape of the sensor enclosure. Prototyping is important because it allows you to envision what you want to create without spending too much money. 1) Use mallet to knock T-nuts into the bottom of the middle plate. It has a hole in the center and 4 holes in the corners that don't go all the way through the material. The t-nuts go in these 4 holes. 2) Countersink the 4 holes in the corner of the bottom plate (has 4 holes in the corners that go through the material completely). We don't have a countersink bit that matches the angle of the machine screws so use a slightly larger one and be careful not to go all the way through the material. 3) Clamp the middle plate (with the t-nuts mounted) to the backplate (with channels and "ear") and use the guide holes in the bottom of the middle plate to pilot two holes into the side of the backplate. Flip the backplate around and do the same on the other edge. Use panhead screws to attach these two plates together with a strip of foam between them. Trim excess foam. 4) Use a drill bit to expand the size of the hole in the center of the middle plate. Microphone board goes here with mic facing downwards. 5) Use belt sander to modify the edges of the c-shaped acrylic pieces to fit into the assembly tightly with gaskets. Drill a hole in the front center of the middle plate and top plate for a 10-32 screw at the front edge of the gaskets of the top and bottom of the c-section at the front. 6) Assemble baseplate and middle plate by using 4 2" screws through the bottom plate, with long spacers, into the t-nuts. 7) Mount sound boards into top plate using 4-40 screws and spacers. Should be centered left-right and towards the backplate (at least.75" away from the back edge of the top plate). The c-sections are not all the same size/depth so make sure it fits per device. 8) Hot glue the microphone board in place in the middle plate, inside the box. Then place the antenna diagonally in place above it within the c-section place. Finally seat the top plate and attach it with 2 pan head screws. Use foam strips between the backplate and top plate and trim excess. 9) Pass the long 3" screw through the two holes you drilled previously in the top and middle plates and fasten with a bolt, tightening to compress the gaskets on the top and bottom of the c-section. 10) Wrap the spacers between the bottom and middle plate with double-sided tape. Wrap the hdpe mesh around the spacers, starting and ending with a little extra at one corner. Use wire to loop around the spacer where they meet and tighten to hold fabric in place. Collects sound values from the microphone. Measures voltage and converts into decibels.